Wichita Area of Kansas Pumpkin Patches, Corn Mazes, Hayrides and More - Find Halloween and Fall Fun! Looking for a local pumpkin patch, corn maze, hayride, gourds and other Halloween activities in Wichita Area of Kansas? Scroll down this page and you will see the all of those in Wichita Area of Kansas, sorted by county. Some are farms, where you take a hay ride out into the field, others are elaborate farm stands with mountains of pumpkins and other activities and some are simple roadside stands. Most have loads of pumpkins to choose from. To really make it fun for your kids, look for those that have the extra activities, like a corn maze, spook house, or hayride. There is usually a small fee for the mazes (of course, the more elaborate mazes tend to charge more. Hayrides are often free. ALWAYS call before you go to confirm the info, they don't always report changes to me! A visitor writes on July 20, 2013: "We LOVE it. Met the owner/operator and he is a very nice person." 10001 NW 77 Highway, Burns, KS 66840. Phone: 316-320-4150. Email: info@walterspumpkinpatch.com. Open: daily beginning the third weekend in September; Hours: 10am to 7 pm daily; except Sundays 1pm to 7 pm; Closed for the season October 31. Directions: Walters Pumpkin Patch is located 10 miles North of El Dorado, Kansas at mile marker 77 on Highway 77. OR off the North El Dorado exit on the turnpike; turn North on Highway 77 and drive to mile marker 77. OR from 1st street out of Newton, Ks (150th in Butler County)we're 4.9 miles South to mile marker 78, and then look for Walters on the right (West) side of the Highway. We're worth the drive. Click here for a map and directions. Payment: Cash, Debit cards, Visa/MasterCard. Click here for our Facebook page. Walters Pumpkin Patch has an extensive list of specialty crops including gourds and tomatoes. Our gift shop is bulging with value added products that are made from our pumpkins and gourds. Be sure to see all our offerings! We have a lot of attractions and things to do that are not listed here. See our website for more listings: 2 jumping pillows, the corn crib slide, underground slides, bag swings, culvert swing, treehouse, human hamster wheel and so much more!. A visitor writes: "We visited Walter's Pumpkin Patch last year near Burns, Ks. and we had a ball. It was a damp, misty day but fun was had by all from our 2, 1 year old granddaughters to us grandparents. The slide was a big hit as well as the concessions and the different varieties of pumpkins available." 9315 194th Drive, Winfield, KS 67156. Phone: 620-402-6781. Alternate Phone: 620-262-7688. Email: events@goquailvalley.com. Open: September 29th through October 28th 2012 10:00 am to 5:00 pm Saturday and Sunday Monday through Friday reserved for school tours. Directions: Click here for a map and directions. Payment: Cash, Debit cards, Visa/MasterCard. Click here for our Facebook page. 6016 S. Woodberry Road, Burrton, KS 67020. Phone: 620-463-7511. Alternate Phone: 316-799-1038. Email: tbeougher@powwwer.net. Open: Saturdays in October from 9am to 6pm and Sundays 1pm to 6pm; Will not be open on Halloween Day; Weekdays by appointment only. Directions: From Burrton west on Highway 50 to Woodberry then south 4 miles to farm. Follow signs. Click here for a map and directions. Grand Opening Saturday October 2nd at 9am; Open Saturdays in October from 9am to 6pm and Sundays from 1pm to 6pm; Free admission with lots of acreage to walk around on and pick your special pumpkin; Many varieties from gourds to giant pumpkins! You May also call ahead for special appointments. Payment: Cash, Check. 374 E 70th, Newton, KS 67114. Phone: 620-367-2721. Email: contact@papaspumpkinpatchks.com. Directions: Located 6 miles North of Newton on Highway K-15, then 3/4 mile East. Click here for a map and directions. Crops are usually available in September, October. Open: Click here for current open hours, days and dates. Payment: Cash, Check. Wide variety of specialty pumpkins and gourds, Mennonite sorghum stalks, large and small Indian corn, broom corn, corn stalk bundles. 1365 Quivira Rd., McPherson, KS 67460. Phone: (785) 227-2656. Email: grammyspumpkinpatch@hotmail.com. Open: WEEKENDS: September 27 thru October 30 (Pre/post season by appointment),Saturdays - 10:00 am to Dark; Sundays - 1:00 pm to Dark; GROUP RESERVATIONS and SPECIAL EVENTS September 27 thru October 30;*All weekdays and weekends (Mondays excluded) *Call or email for reservations. Directions: From Lindsborg. Head south on US 81/Cole St/Harrison Street Go south 7 miles -Turn right (west) onto Quivira Road Stay on Quivira Rd for 1/2 mile & driveway entrance will be on your left. From McPherson -Head north on Main street. At the end of Main Street you will merge with 14th Avenue Stay on 14th Avenue for 7 miles. Turn left (west) on Quivira Road Stay on Quivira Rd for 1/2 mile & driveway entrance will be on your left. Click here for a map and directions. Payment: Cash, Check, Debit cards, Visa/MasterCard. Farm Fresh Eggs (depending on the chickens), Grass Finished Beef,Fresh Cinnamon Rolls, Frito Chili Pie (Saturdays only), Homemade Cookies. 408 N. Kent Road, Hutchinson, KS 67501. Phone: 620-662-1581. Email: bethanynazarenechurch@gmail.com. Open: October 17 to 31 on Monday to Saturday, from 12:00pm to 8:00pm; Closed on Sundays. Directions: 3 easy miles east of the Hutchinson Airport On the corner of 4th and Kent Road at 408 N. Kent Road. Payment: Cash, Check, Visa/MasterCard. 31617 W Parallel Rd, Turon, KS 67583. Phone: 620-497-6715. Alternate Phone: 620-497-6697. Email: info@harvestfarmks.com. Open: Saturday 10 to Dark Sunday 1 to 6. Directions: Click here for a map and directions. Pumpkin Patch is open weekends starting the last weekend of September to October 31. Payment: Cash, Check, Visa/MasterCard. Click here for our Facebook page. Admission to farm is $6 per person, 2 and under are free. Please see website for complete prices and activities listing. 1565 15th Rd, Lyons, KS 67554. Phone: (620) 894-0390. Email: sweetnsauer@lrmutual.com. Open: October on Saturdays from 10 a.m. until 6 p.m. and Sundays from 1 p.m. to 6 p.m.. Directions: See their website for directions. Payment: Cash, Check . Enjoy family fun this fall at the Sauer Pumpkin Patch just south of Lyons, KS. They have fall treats and pumpkins for your family to take home, hay rack rides, a petting zoo, a kiddie train, super sling shot, a milking station, swings, a maze, and more! Admission is only $3.00 and includes all activities on the property and 5 sling shot chances to win a FREE PUMPKIN!! Directions to the patch are pretty simple. While traveling Highway 56 (also known as 96 or Main St.) turn south at ShopKo. You are now on Century Rd (also known 15th Rd). Drive south for 2.5 miles. The road will turn from pavement to dirt and you\'ll find our entrance to parking just past the green hill. See you soon! A visitor writes on October 12, 2013: "We had a blast for only $3.00 a person! Spent the whole morning running around the Sauer's farm/Pumpkin Patch. Activities for the young kiddos and for my teenagers too." 2130 South Webb Road, Wichita, KS, 67207. Phone: 316-712-9129. Email: cccum@cccum.org. Open: first 4 weekends in October; Friday 6-10:00 pm (last ticket sold at 9:00 pm); Saturday and Sunday from 4 pm to 10:00 pm (last ticket sold at 9:00 pm). 8401 S. Meridian, Haysville, KS 67060. Phone: 316-522-3475. Alternate Phone: 316-524-1790. Email: CornMazeWichita@yahoo.com. Open: See our website for current hours. Click here for current open hours, days and dates. Directions: 1 1/2 miles South of Haysville on Meridian. Click here for a map and directions. Payment: Cash, only. Click here for our Facebook page. We have by far the largest corn maze in Wichita (15 acres). Over 200 fun trivia questions and brain teasers are located throughout our maze. Answer so many correctly and win a free pumpkin. 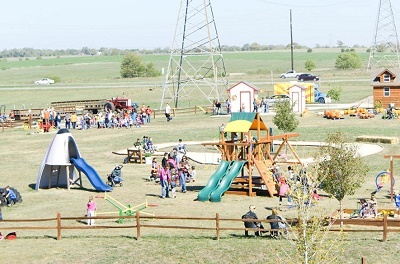 Also enjoy one of our many other attractions when visiting the corn maze such as trailer rides, inflatables, movies, carnival games, giant slingshots, the mindless mini maze, the two-headed copperhead, tractor tire swing, tornado twister, fun ball, quad teeter rider, merry go cycle, concessions, and more!. Click here for a Coupon We have two mini-movie theatres that are always playing something for adults and for the little ones. They're in rooms with hay seats, so it's a great place to beat the brisk cold and warm up. We have a carnival game room with many fun games for everyone to try to get prizes from little yoyos to 4 foot stuffed animals. Tickets for carnival games can be purchased in bulk for extra tickets. We have things from: ice cream cones, philly-cheese steak sandwiches, pizza, hot pockets, chips, pretzels, cookies, candy bars, hot chocolate and hot apple cider, ice cold pop and plenty of water. Spend your whole day with us. Be sure to verify out the website or call the phone number to answer all your questions. We cannot wait to see you! 6059 S. Seneca, Wichita, KS 67060. Phone: 316-524-8062. Email: coxfarm@cox.net. Open: September Thru November open everyday from 10am to 7pm. Click here for current open hours, days and dates. Directions: Click here for a map and directions. Payment: Cash, Check, Debit cards, Visa/MasterCard, Discover, AmEx. 8135 south 119 st. west, Clearwater, KS 67026. Phone: 316-706-5391. Email: debklaus@hotmail.com. Directions: From the corner of US 54 Highway (or Kellogg) and 119th st. west go 81/4 mile south. And for a map to our farm, click here. Crops are usually available in September, October. Open: Monday to Friday (by appointment only) field trips usually start at (9:00 and go to 4:00) we have done tours later but we need appointments set for all!! !From the mid-September through October we have a PUMPKIN PATCH, PIG RACES and HAYRACK ride. Dairy Tours are available March through December. The Pumpkin Patch-Hayrack Rides, and Pig Races will be open on the weekends to the public (no reservations on the weekend needed) during the month of October (only October). Please make reservations for all other times. Dairy Tours Almost Every day (by appointment) Pumpkin patch September through October Payment: Cash, only. Call for prices!! A visitor writes on September 19, 2010: "LOVED IT!!! " 3750 South Dusty Road, Derby, KS 67307. Phone: 316-733-1887. Alternate Phone: 316-833-1400. Email: roadsendranch@hotmail.com. Open: All weekends in October Saturday 10 am to 7 pm Sunday 11 am to 6 pm Weekdays by appointment only please call. Click here for current open hours, days and dates. Directions: Just off 39th street south, between 143rd street east and 127th street east look for the signs. Click here for a map and directions. Payment: Cash, Debit cards, Visa/MasterCard. Click here for our Facebook page. boat rides, swings, teeter totters, campfire, giant sand box, kiddie swing,log walk, tug or war pit, dried out gourds, decorative gourds and pumpkins for sale. 9836 S Hydraulic, Haysville, KS 67060. Phone: 316-7881370. And for a map to our farm, click here. Crops are usually available in May, June, July, August. Open: Monday to Saturday 8am to 5pm closed Sunday. We are open from the middle of May to the end of August. Payment: Cash, Check.